Friday, September 7, the Cannonball Endurance Run 2012 leaves Newburgh, New York; over 75 riders starting their coast to coast 14 day 3500+ mile ride. A few days later, September 10 at about 1,000 miles, riders will overnight in Anamosa, Iowa, home of the National Motorcycle Museum. Cannonball Run 2012 Stops at National Motorcycle Museum in Anamosa, Iowa - A Once in a Lifetime Chance! On the Road Maintenance During Cannonball Run 2010 - Felicia Morgan Photo. After rolling up about 1000 miles, Cannonball Endurance Run coast-to-coast riders will stop and overnight near the National Motorcycle Museum, Anamosa, Iowa. This makes for a fun once in a lifetime chance to visit the National Motorcycle Museum on Monday evening September 10 and see over 75 pre-1930 antique motorcycles fresh from 1000 plus miles on the road! Riders will arrive mid- to late afternoon and the Museum will stay open until 8:00pm the day riders roll in. The Cannonball Run 2012 starts in Newburgh, New York and finishes in San Francisco, California. Riders will log over 3500 miles on their way west, and you can stop by the National Motorcycle Museum and check their progress. 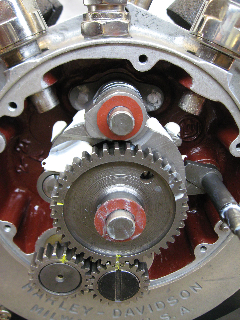 Watch as riders make adjustments, lubricate and take care of any unexpected mechanical problems. 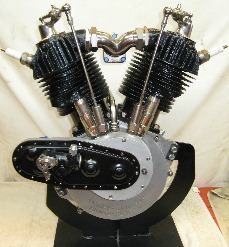 No trailer queens; these bikes made in Europe, England and America are mechanically restored and ready for the long haul. They will be ridden in the ways of the great Erwin "Cannonball" Baker who set the record of 11 days+ in 1914 on his Indian, earning him the nickname. 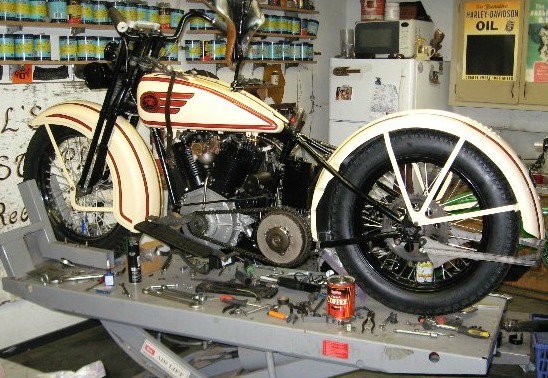 Matt Olsen has the John Parham/National Motorcycle Museum sponsored 1928 Harley-Davidson JD rebuilt and restored and is doing final assembly, then putting on some break-in miles. Primary engine is installed and ready to break in, but a spare engine and transmission will be rebuilt and taken along for "insurance." 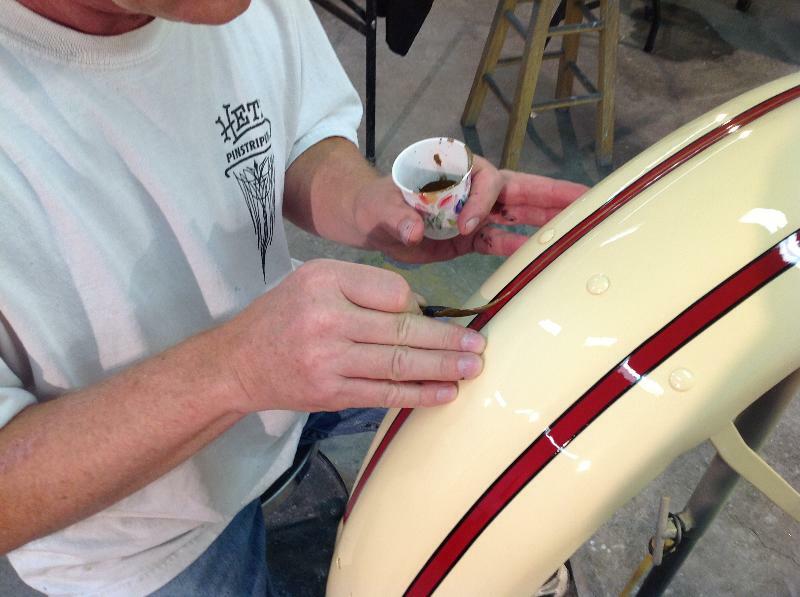 Jim Hetzinger, J.C. Hetz Studio did the paint. Logo is hand painted. 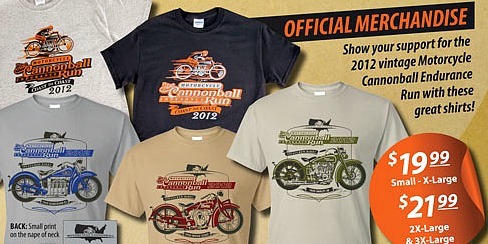 Grab some goodies in the gift shop like official Cannonball Run 2012 T-shirts and caps and support the riders including Matt Olsen who will be on the National Motorcycle Museum/John Parham sponsored 1928 Harley-Davidson JD. 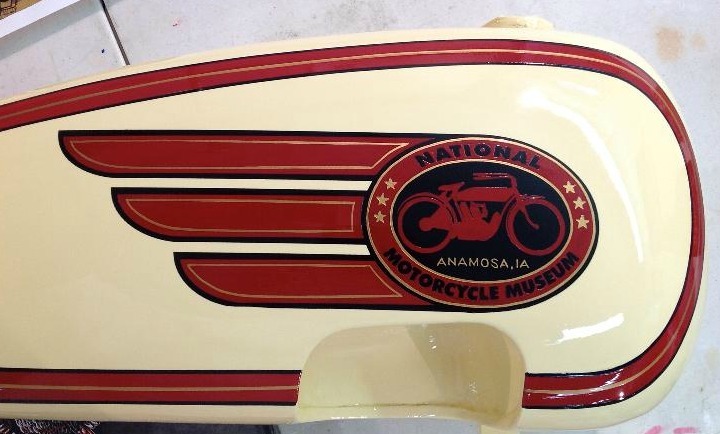 Cruise into the National Motorcycle Museum located at 102 Chamber Drive in Anamosa, Iowa. 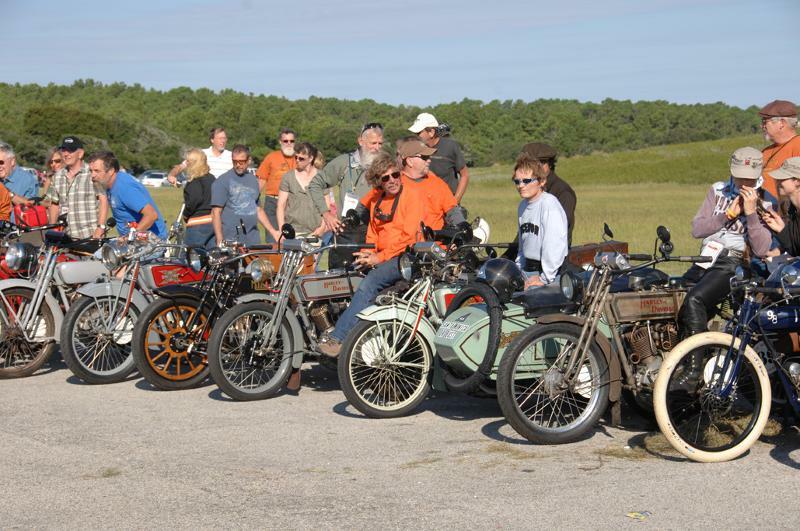 Experience the extensive display of over 400 motorcycles from around the world as well as thousands of photographs, posters, motorcycle memorabilia, a collection of antique toys and bicycles, even a restored 1920's Shell gasoline station.